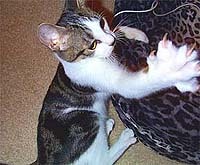 Pulling on objects with front claws (scratching) is an instinctive behavior common to all cats. Scratching is necessary in order to remove old dead nail fragments, allowing for the growth of new nail tissue. Cats also mark territory by scratching on objects. Even though scratching is a normal behavior, it can be extremely destructive. Cats enjoy scratching on many objects. When these objects include such things as furniture, doors and window frames, significant damage can be done to many household items by the scratching behavior of your cat in a short amount of time. Training your cat to use scratching posts and regularly trimming his or her nails can be helpful in minimizing damage to household items. With proper training, some cats can not only be trained to use a scratching post, but can also learn what items NOT to scratch. There are also nail caps that can be purchased which are fitted over the cat's claws. In some cases, the decision is made to surgically remove the cat's claws. Onychectomy (declawing) is the term given to the surgery involved in permanent removal of the claws. Declawing is done under general anesthesia and a brief post-surgical stay in the veterinary hospital is often recommended to minimize complications. Post-operative medication is routinely used to ease discomfort. In order to promote healing, special non-irritating cat box filler should be used for a week or so in place of your cat's regular kitty litter.